Where do we start? — Buda Mill & Grain Co. When people ask us what's been taking us so long, I look back at these pictures we took in 2010. And, I try to remember that we wanted to recycle and reuse as much as possible. Just a few words that describe hours of work. Starting back in 2010, owner Gay Dahlstrom, her daughter, Dodi (me), and her grandson, Saenger agreed to start renovating the mill. We started walking around the old mill to decide what should stay and what should go as we considered re-developing the site that the owner's father bought in 1962. First thing we decided was to remove the four of the smaller steel silos. Saenger found a company that would demo out the silos in return for the steel. So, the silos were cut up, lifted out and crushed so they could be recycled. The brick building, that had housed the cotton gin since 1914, could be seen again. The old scale house was disassembled and the materials were re-used on someone else's ranch. The old scale, located to the north of the current bakery, was removed and scrapped. Piles added up as steel posts, old galvanized tin, pieces of cars, bits of machinery, hundreds of tires were separated for recycling. Brush piles grew as the site was cleared down to the bare bones so we could only see the original footprint of the Mill. 100 year old pine boards that lined the interior walls of some of the metal barns were saved. Unusable trusses were re-made into barn doors. Cedar fencing found new life in the ceilings. In just three years, after dragging, burning, scrapping, piling, selling and saving what we could, the fun can finally begin as we start renovating the old barns. 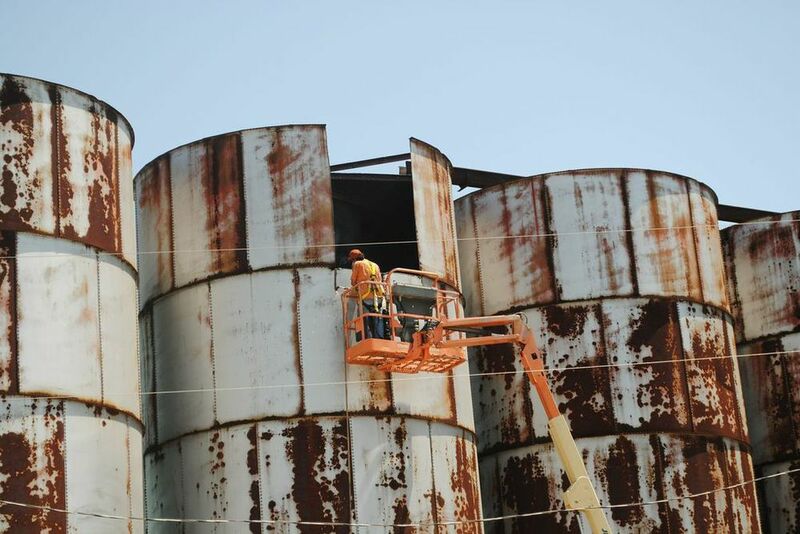 We used a crane to lift the old silos out and later crush them so they could be recycled. The original 1914 brick cotton gin that sat for years behind the 4 smaller silos. One of the two scales on the property. This one was located next to the current bakery. The scale that was pulled out. We had to demo out many of the pieces of auger that had originally moved the grain through the buildings, some were buried in the concrete floors or laying across the overhead trusses. Old abandoned trucks where hauled off and sold.